The dwarf galaxy NGC 4449 is the first dwarf galaxy with an identified stellar stream (faintly seen at the lower right, and in inset). The star stream represents the remains of a smaller satellite galaxy merging with NGC 4449. The inset image shows the stream resolved into red giant stars. Image released February 8, 2012. This story was updated at 1:39 p.m. ET. A small newfound galaxy with an oddball shape may be the product of a close encounter with a neighboring galaxy in what scientists are calling a "stealth merger," a new study reveals. The cosmic discovery came as astronomers investigated an isolated dwarf galaxy known as NGC 4449, which is about 12.4 million light-years away and is a "starburst galaxy," meaning it forms young stars at a furious pace. This galaxy has a distorted shape as well, a look that is wreathed in hydrogen gas abounding with rings, shells and a core spinning the opposite way of the galaxy. Researchers have suspected the galaxy's hyperactivity and complexity might be due to it tangling with another galaxy. Now, two different teams of scientists have detected the most likely galactic interloper - a previously unseen dwarf galaxy about 29,300 light-years from NGC 4449. Dubbed NGC 4449B, it is the largest dwarf galaxy known in the "local group" that includes the Milky Way and the Andromeda galaxy. "This is how galaxies grow," said astronomer Aaron Romanowsky of the University of California, Santa Cruz, a co-author in one of two separate studies on the interacting galaxies. "You can see the smaller galaxy coming in and getting shredded, eventually leaving its stars scattered through the halo of the host galaxy." The researchers dubbed the interaction a "stealth merger" because the smaller galaxy NGC 4449B was nearly imperceptible, but has a profound effect on the shape of its partner. Romanowsky and his colleagues detail their findings in a study to appear in Astrophysical Journal Letters. They used telescopes in California and Hawaii to photograph the two galaxies. A separate study on the discovery of NGC 4449B appears in the Feb. 9 issue of the journal Nature. NGC 4449B, illustrated here to scale as a ghostly companion to our Milky Way, would stretch from the center of the Milky Way to the sun's position, if placed in our galaxy. This is an artist's conception; NGC 4449B lies some 13 million light years distant from our galaxy. NGC 4449B has a twisted shape too, and is essentially a gigantic "S"-shape so large that if one end were placed at the center of the Milky Way, the other end would reach all the way to the sun's position. This oddball shape hints that it was engaged in a gravitational tug-of-war at some point, researchers said. "It has clearly suffered a very violent shock and may well be on the way to being dissolved," said Michael Rich, an astronomer at the University of California, Los Angeles and lead author of the Nature study. Rich and his colleagues used the Saturn Lodge Observatory in California to spot the NGC 4449B galaxy. They soon suspected it was disrupted by a close encounter with its larger companion. "The dwarf is quite interesting — it seems it encountered NGC 4449 on an almost comet-like or 'plunge' orbit," Rich told SPACE.com. (Left) NGC 4449 shown as imaged using the Centurion 28-inch telescope in a three-hour exposure. (Right) NGC 4449 after image processing, including subtraction of the smooth light of older stars. The full extent of the tadpole-like companion NGC 4449B is revealed, including a faint streamer of stars extending toward the nucleus. The images of NGC 4449 revealed other surprises as well. For instance, the galaxy has a strange arc of stars that may be another ingested galaxy, and a halo of old stars that appears to consist of two parts, the outermost part of which makes NGC 4449 roughly the size of the Milky Way. 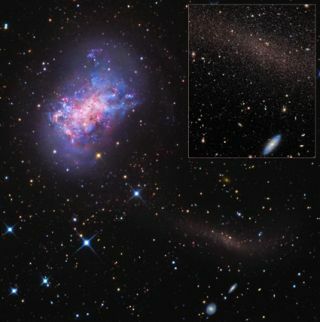 The origin of these old stars remains uncertain, but the starburst galaxy may have acquired them when other galaxies like NGC 4449B fell into the galaxy and were shredded, Rich said. Scientists have seen other disrupted galaxies before, such as the Sagittarius dwarf galaxy near the Milky Way, which has "a trail of stars wrapping at least twice around our galaxy." However, those other galaxies are much further along in their destruction. In contrast, NGC 4449B appears to have only had its first encounter with its companion, helping shed light on what the early stages of such entanglements are like. "I plan to survey more galaxies in an effort to find similar objects," Rich said. This story was updated to include more details on the interactions between the two galaxies based on the second study to appear in Astrophysical Journal Letters.Visit SPACE.com for the latest in space science and exploration news on Twitter @Spacedotcom and on Facebook.